With the progression of technology and devices becoming more affordable, there has been a significant increase in the amount of people that own and utilise different technological devices. Accessing the internet has become easier than ever with just a few clicks from a smartphone or tablet. Whilst the internet has had an impact on several things such as our television viewing habits or banking, it has also significantly impacted education. It began with institutions slowly introducing and utilising the internet as part of their teaching processes, whether that was through recommending and sharing relevant articles or asking students to watch a video of a debate. This proved to be a great means of facilitating learning and therefore the internet quickly became central to the teaching process. This inevitably resulted in the introduction of e-learning. Countless courses and resources are now available to students online, providing them with the option of pursuing education online. This has been revolutionary by making higher education more accessible, whilst retaining its quality. E-learning differs from traditional education by being based solely online, therefore not requiring students to attend physical classes. With the accessibility of several devices, it not only makes it easier to learn but also caters to the new generation of young adults that have grown accustomed to using technology to carry out tasks. Institutions have also found it to be a more cost-effective approach by requiring less commitment from instructors through not having to teach in a classroom everyday. Some students have also found e-learning to be a more interactive approach through elements such as peer-grading. This is when students are able to mark each other’s work, which not only means that there is no requirement from the instructor to complete this task, but also that students are interacting with each other in the same way that they would in a classroom. Things such as virtual software are already utilised in traditional education for accessing modular information online or posting content that students may find helpful. This aids the learning process by making it easier for students to catch up on work that they may have missed or to find more resources that can help their understanding of subjects. E-learning is also presented as a more supportive approach to education with the availability of online communities and social media platforms. Therefore, the perception of online learning as a solitary experience no longer holds validity. With assignments already being submitted online, it demonstrates just how everything is quickly becoming digitalised. The internet will continue to take precedence and slowly replace facets of regular education due to being more cost-effective and relieving institutions of more responsibility. With its integration into regular education and full degrees being made available online, it is evident that the internet has changed the face of education. As society becomes more dependent on technology, the way that we absorb information will continue to shift and therefore education must be flexible and adapt with it. From writing on a chalkboard to learning from behind a screen, the face of education has rapidly evolved. With technology quickly becoming heavily involved in our everyday activities such as when making payments or checking the weather, its use in learning has slowly been implemented into traditional education and has revolutionised the way that students are being taught. In fact, it is now possible to gain and study for an entire university degree online. It could be argued that traditional education has always been presented in a concrete form whereby a teacher is likely to stand and recite information that the student is expected to understand and remember. However, with the development of technology and the internet, education is now being offered in a more appealing and digestible form. Below are a few of the ways in which online learning has changed and helped to evolve education. E-learning caters to all learning styles. Through using virtual tools, whether that is showing a video in a classroom to explain a concept or participating in an online quiz, students are more likely to remember information and engage with the things that they are being taught. E-learning allows schools to accommodate different learning styles through its various teaching methods, leading to students producing better results whilst also retaining information once they have completed the course. When everyone learns in different ways, courses need to be tailored for students which is something that traditional education has not previously allowed. Appeals to a wider audience.With the job market becoming more competitive, there is more pressure on employees to remain focused on self-development. However, they are not able to commit to attending a university class whilst working a full-time job, therefore online learning presents them with the opportunity to learn without it impacting them in the workplace. E-learning makes education accessible to everyone whether that is a mother with children or people that are in circumstances that do not allow them to attend classes every day. Offers flexibility. Traditional education has always consisted of having to be present in class everyday with the risk of falling behind if unable to attend. However, e-learning makes it possible to both learn in your own space whilst co-ordinating your own schedule. This can often be revolutionary for many people that may be balancing several commitments as discussed above. However, it also means that individuals can be more productive by learning from anywhere, whether that is on their commute to work or when travelling to another country. It is not only teaching through an online platform that has enhanced education, but also the learning process and experience which has become a more appealing way of gaining a qualification. When society is already so accustomed to relying on technological devices to look up information, e-learning acts as the next step and therefore opens up the pathway to a more educated and well-informed society. The internet is a pool of resources and with a majority of books now available in electronic form, it has vastly improved the accessibility of information. This again contributes to e-learning and allows students to read and seek relevant material without having to leave their home. Online learning degree makes education accessible whilst also presenting it as something that is achievable by individuals that may have found that they do not work best in a classroom setting. It also makes information and courses more readily available with things such as MOOCs increasing in popularity. With the e-learning market continuing to grow in worth, things such as virtual technologies and mobile learning are gaining precedence and will vastly be incorporated into traditional education. As institutions are already utilising virtual platforms and finding them to be a more cost-effective route, it is evident that education will quickly become digitalised. Through changing the way that people are gaining an education, it not only ensures that everyone has access to education but also impacts the economy whereby people will continue to self-develop and therefore gain more skills. Overall, with the quick implementation of technology into learning, the future of education is online. Whilst the evolution of technology continues to impact and streamline the way that we carry out even the most meticulous daily tasks, it has also unnoticeably changed the face of education and the way that we consume and digest information. In fact, with the ever-changing nature of technology, society itself is continually shifting to accommodate it. Our reliance on technological devices has quickly evolved into implementing and carving them into a means of gaining and seeking knowledge. Therefore, the revolution of both the learning and teaching processes was inevitable. M-learning refers to mobile learning, comprised of a more social and interactive approach to education through the use of electronic devices. Through aiding institutions in creating a digital classroom, m-learning not only educates students but offers a more cost-effective route for both parties. With devices such as tablets accessible to all, the concept of education itself is presented as a more attainable goal, creating opportunities for those who may not have previously had the means. How is m-learning helping to boost e-learning? Mobile learning offers a more engaging and interactive means of gaining knowledge. When society itself is accustomed to digitalisation, people are more susceptible and open to the idea of learning online. In fact, education has shifted its focused to catering to the needs of the student and their learning experiences through altering and customising content. This not only enhances the student’s learning but ensures that they are gaining the most out of their education whilst being able to retain and fully absorb information. It is easy for an individual to feel drowned in information, whereas mobile learning offers an alternative by providing content that is captivating and engaging. Whilst e-learning itself has quickly revolutionised education, it is often still perceived as a huge commitment whereas m-learning bridges this gap. It breaks information down and presents it in a more appealing manner. For example, an institution may utilise this through training their staff. When information is presented in an unconventional approach and manner, employees are more likely to excel and engage. – Cost effective. In an era where almost everyone has some type of technological device in their possession, it brings education to the student and simplifies the process of learning. Instead of having to purchase textbooks or travel to an institution for a class, m-learning eliminates this and thereby ensures that knowledge is available in a few simple clicks. This can be especially beneficial for institutions, for example when the management decide that they would like to train employees in a certain area. Instead of having to commit to enrolling them in a full university course, they have the option of using m-learning which not only educates staff but is overall a more cost-effective approach. – Flexible. 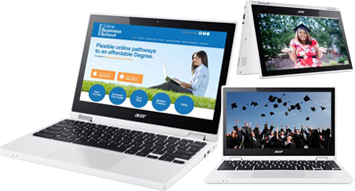 With information accessible across multiple devices, information is available from anywhere in the world at any time. This not only opens up education to employees and students but also ensures that they are able to balance several commitments. For example, an employee is able to attend their full-time job and then return home to study without it impacting his or her work performance. – More appealing. With information being presented in a digestible form, it turns the concept of education itself into something that is more achievable. Some people are deterred by the idea of having to sit in a classroom and therefore disregard the idea of studying, however m-learning makes it possible to learn and gain information in different ways. For example, an employee is more likely to watch a few online videos on their phone than attend a physical class every week for a month. M-learning makes education more appealing to everyone. With it quickly being implemented in the workplace and through educational institutions, there is the capacity for m-learning to continue to evolve. Its flexibility and alluring nature is more appealing to audiences and therefore it will continue to change e-learning and our approach to information. This will not only contribute to a more knowledgeable and well-educated society but will also help individuals with self-development. M-learning is already being utilised in places such as museums and only looks to continue evolving and being utilised in other areas. With the growth of technology, the manner in which information is presented will continue to shift. In fact, one could argue that information is becoming dependent on technology and therefore its consumption will change as devices do. As factors such as having a shorter attention span become more prominent, education itself will continue to morph and change in accordance to technology. Online learning: How technology is encouraging learners to stay connected? As we reach the middle of 2016 online learning is becoming more prominent with the popularity and access growing rapidly. There are many benefits that come from Online Learning please click here to see a previous blog of these benefits. The rise in Online Learning is now appealing to large corporates. 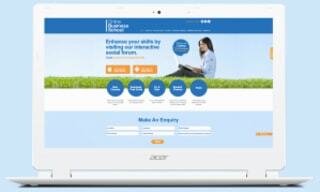 Corporates have started to introduce the scheme for their employees to start an online degree. Companies such as Starbucks have now started to offer this which allows the company to retain employees throughout the completion of the course. The corporations hope that this will make their workplaces more attractive to employers and also aim is to help less skilled employees to gain a degree. Online Learning has become the new way to gain your degree without all the costs and hassle associated with the traditional degree route. Online learning is a lot more flexible than a normal traditional degree. You don’t have to physically attend a lecture, you don’t have to battle that morning commute, there’s no having to go all the way into campus to hand in your work. Everything is done online including all lessons and all submissions. Some students feel as though if they study online they won’t have any help and almost feel like they are alone. That is definitely not the case, and with OBS we make sure you are not alone in your journey. There is an interactive social forum which can be used to ask any questions to other students who are completing the same course. Online Business School support is also available for students around the clock, if any student needs help with work they can request a one on one study session with a tutor at any time. This may help the student feel more comfortable and feel as though they are being assisted as much as they can be throughout their course. We also have our live chat facility on the website which is manned by the OBS team 24/7. The Online Business School continues to grow daily, not only with the students enrolling with us, but with the technology we are making available to students. Online Business School try their best to give students everything they need to comfortably and successfully complete an Online Degree qualification. The release of the new App is an example of this, not only is this learning from ‘Home’, it’s now been made possible to learn on the move.